Wireless charging isn't a new concept at all, but to charge your devices you are still required to place your phone on the top of charging pad. Quite annoying sometimes when slightly misaligned of a device caused your phone not to charge. Now, imagine you never have to plug in your smartphones again, or technology that charges multiple devices at one time. This is what Energous Corporation is all set to offer you. 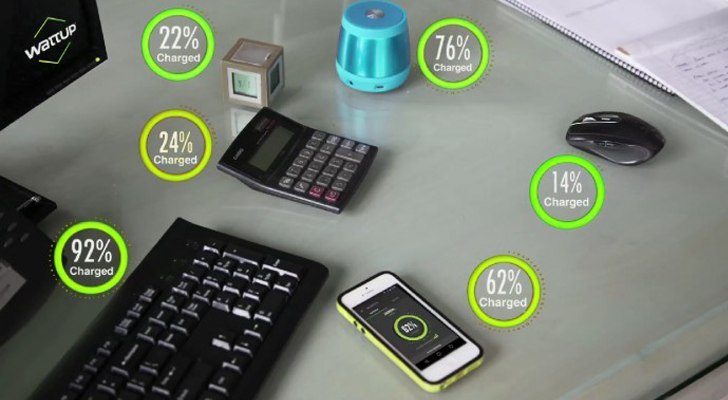 The technology company Energous Corporation is about to launch WattUp — a wireless charger that will change the way people charge their electronic devices at homes, in the offices, in the car and beyond. "With WattUp, you no longer need to worry about looking for a charge: once you are in a WattUp wire-free charging zone, the battery life of all your devices will simply be managed, seamlessly and intelligently, so you can devote your time and energy to what really matters," the Energous website reads. WattUp is capable to charge your smartphones and other battery-enabled devices on the go using the same radio waves abundantly flowing all around us as a Wi-Fi router. Previously demonstrated at CES 2015, WattUp works by using a mix of Radio Frequency (RF), Bluetooth and a lot of patent-pending technologies. WattUp transmitter communicates with and locates compatible devices using a Bluetooth module. Once they are connected to a device, they beam out RF signals that are then converted into DC power by a small chip embedded in the device. Devices that require charging should be within the range of up to 5m (15 feet) of Wi-Fi signals, just like you use wireless hotspot in your offices or at homes. In case if the power signal from your living room router is stronger than the power signal in your bedroom and you are going in the kitchen, your device will make the switch. When would I expect WattUP? These WattUp transmitters can eventually be built directly into household appliances like a wireless speaker, Televisions or any other device that uses power continuously, but for now you need to put your smartphone into a WattUp-enabled battery pack. The company says that WattUp battery packs could be ready for the consumer market possibly by the end of 2015 or at the beginning of the next year.